The S&P 500 traded back above its all-time high of 2872.87 on Wednesday and Thursday. The index finished out the week on Friday at 2871.68, back under the high by just under two points. Not a big deal. 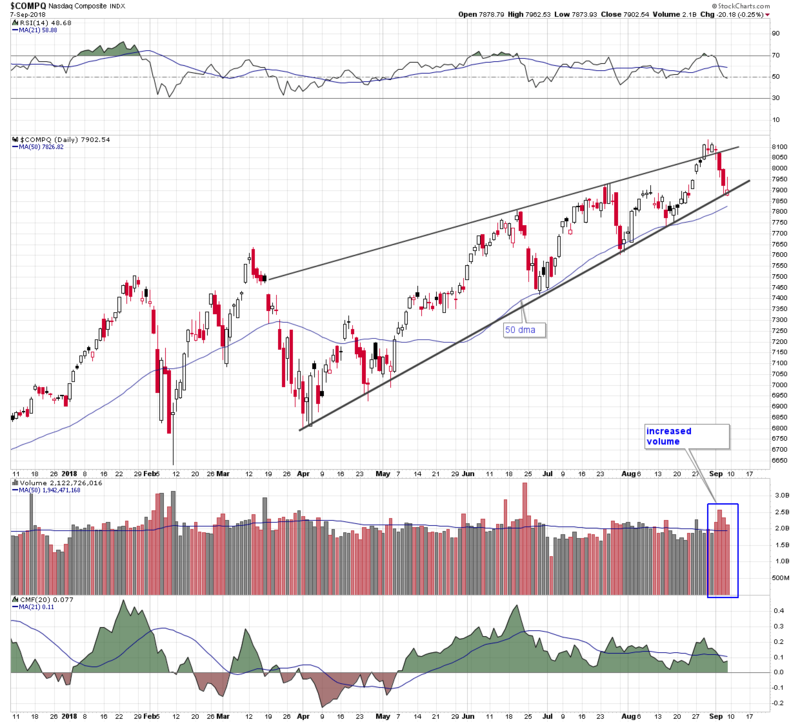 There were, however, several important support levels on the major market index charts that were either broken or tested over the last five sessions. And it is safe to say that there was a generally uncomfortable feel to the trading action all week and particularly on Friday into the close. Possible causes of that vexation was the continuation of the pullback in the technology sector, the news of the departure of another executive officer from Tesla, and the threat of further trade sanctions against China. All were a part of the backdrop of this week’s trading. Take a look at the daily S&P 500 chart. 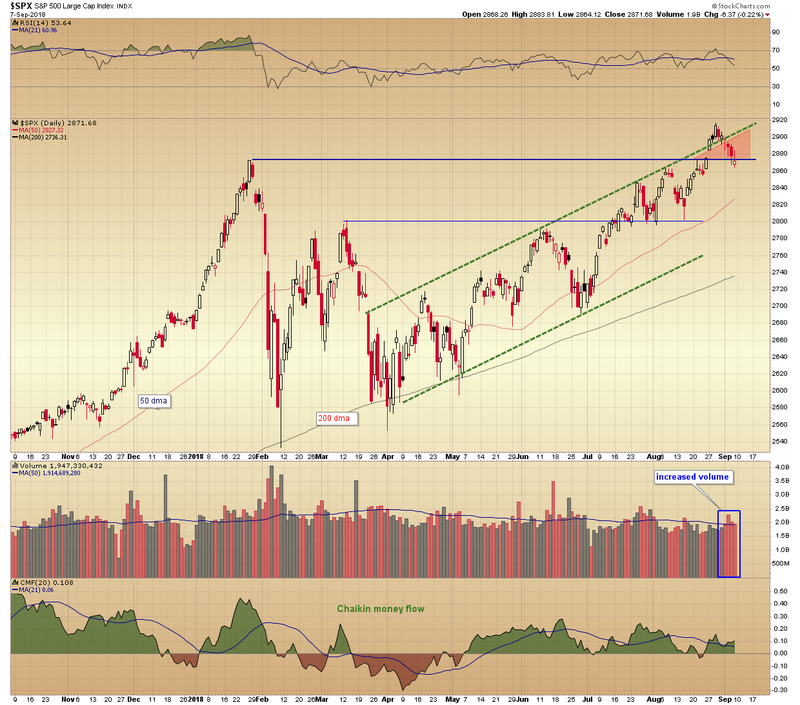 We have been following its ascent within the borders of a rising channel pattern for some time. Last week it broke above channel resistance and its January high. 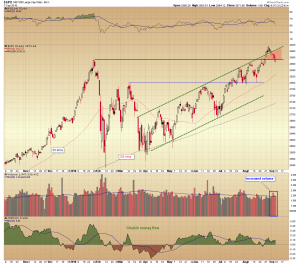 The relative strength index entered an overbought condition but it looked like the red area delineated by the channel trend line and the previous high level would be solid support going forward. That was not to be the case. The “solid” support area was penetrated just four trading days later. Instead of a bullish hammer candle forming at support like we saw at the recent August low, a bearish inverted hammer formed, which closed below the support area. 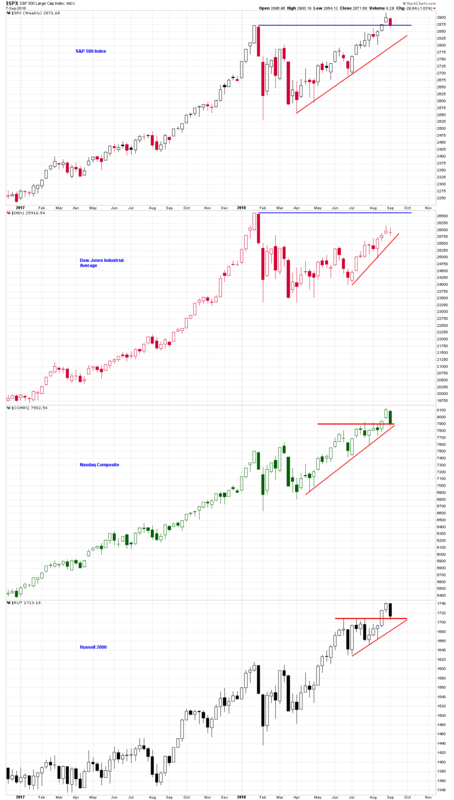 A similar candle formed on the NASDAQ Composite daily chart on Friday, directly on its rising triangle support line. These high wick doji-like candles reflect an inability to hold their upper range and a subsequent return to their lower starting points, at a critical technical juncture. There was also a significant increase in volume this week and the Volatility Index (VIX) was up 15.7%. Elon Musk apparently was not concerned about any of these technical issues and appeared quite mellow on an internet comedy podcast on Thursday evening. Shareholders were not amused and took Tesla shares lower. 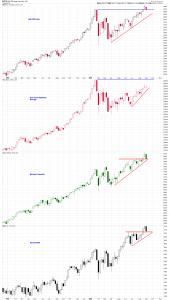 Bottom line is this – any negative price action as a stock or index is attempting to recapture former all-time highs can look particularly ominous. It is not so much the price pattern or candle formation but a psychological transition in the point of view of traders. Sentiment goes from being confident about the continuation of the rally, to being skeptical that it can continue without a pullback, to finally deciding to take profits. So, the thing to focus on is volume and money flow as a reflection on underlying trader sentiment. 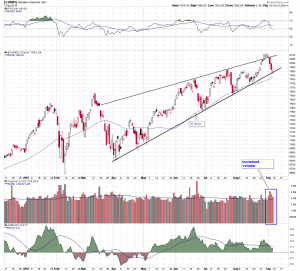 This week there was an increase in volume on the S&P 500 and NASDAQ Composite, and Russell 2000 charts. In all cases, it significantly exceeded their 50 day moving averages of volume. This is something to watch if you are of the positive or skeptical mindset about the markets. If you are negative then further downside next week would be a good reason to take some profits.